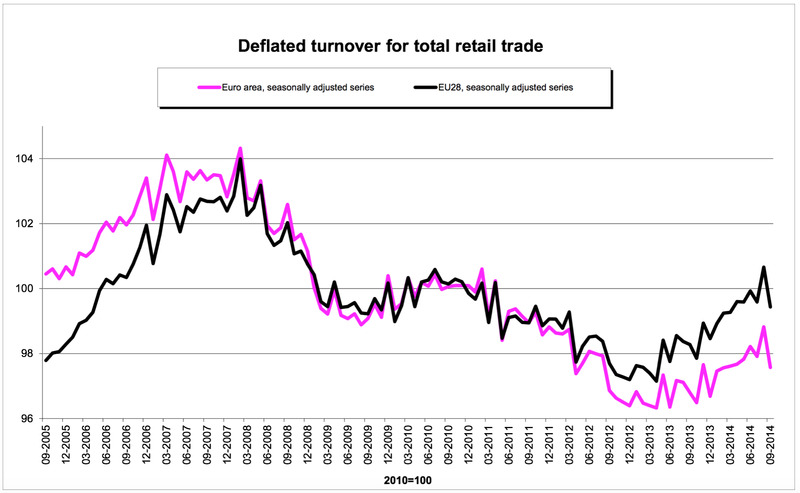 September’s retail sale figures are the eurozone’s latest grim economic indicator: sales dropped 1.3% from August to September, up just 0.6% from September last year. Some recovery. Analysts had expected a 0.8% drop in sales between August and September, which would still have left the figure up by a modest 1.2% from September last year. 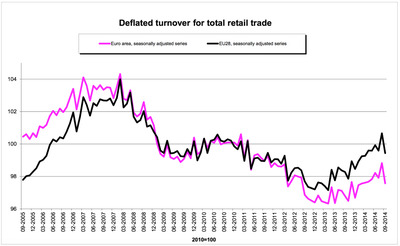 Not only are the eurozone’s retail sales not back at pre-crisis levels, they’re not even back at 2010 levels, still hurting from the European Central Bank’s 2011 rate hikes. While the UK and US economies are back above their 2008 levels, the euro area is still lagging far behind. And with dismal growth expected for years, the gap between the major recovering economies and most of Europe is likely to grow.